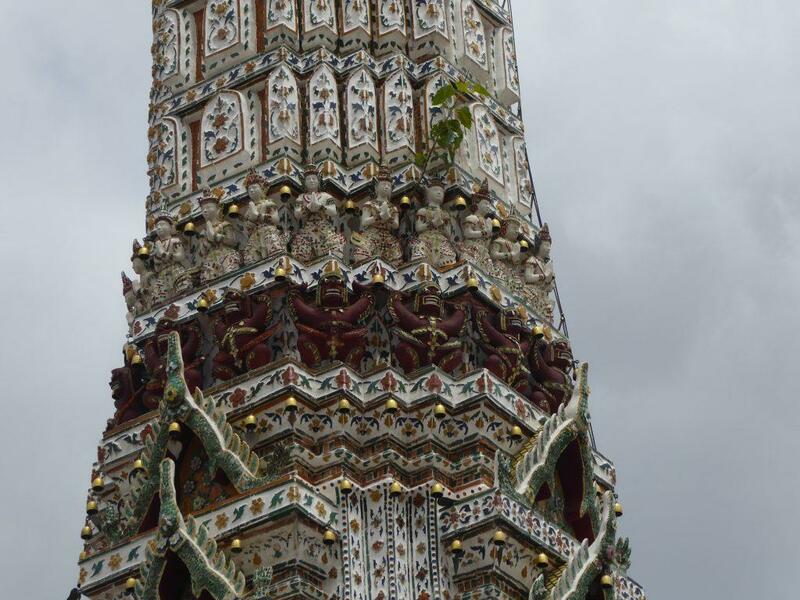 Wat Arun in Bangkok is also known as The Temple of Dawn. 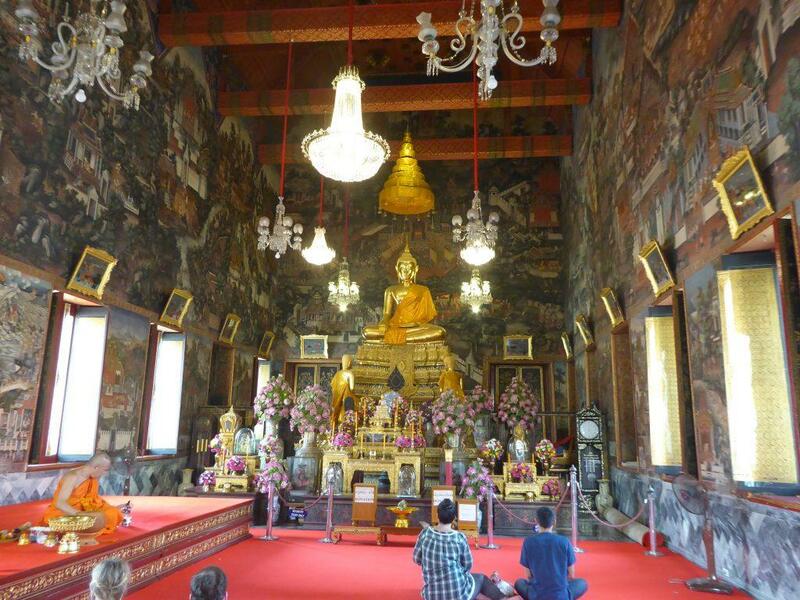 The ancient Bangkok Temple is one of Bangkok’s most famous landmarks and tourist attractions. 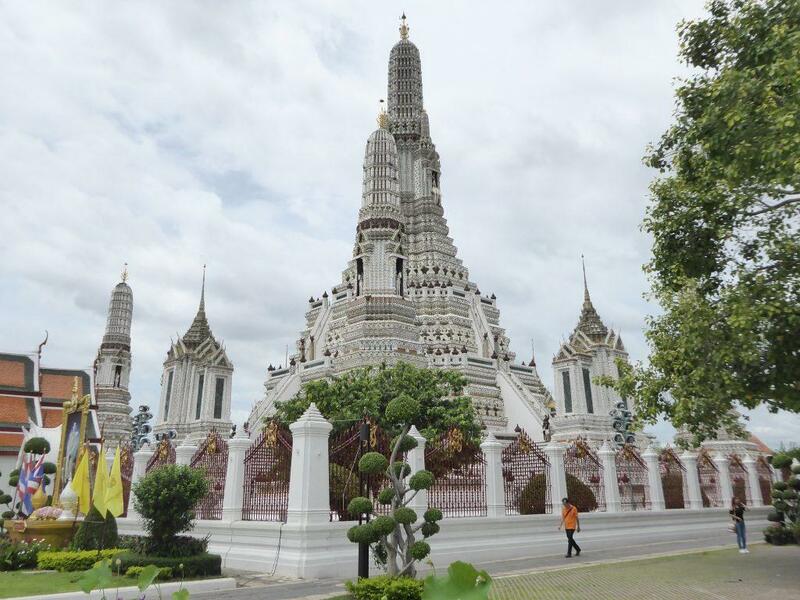 It’s located on the Thonburi side of the Chao Phraya River. 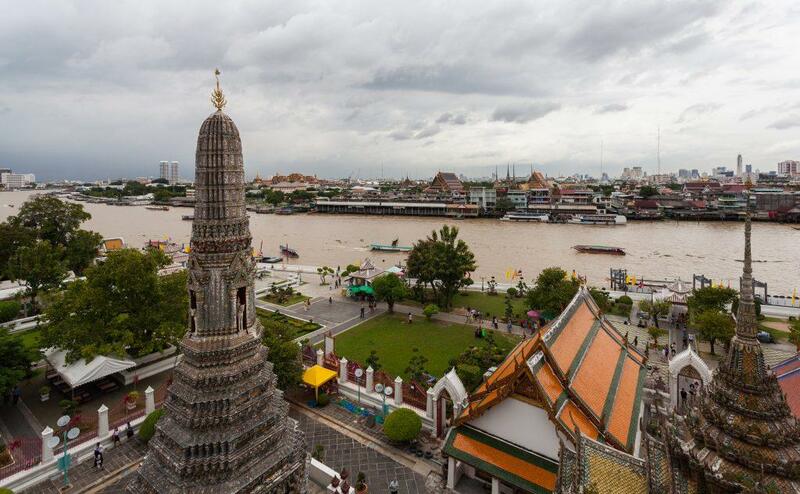 Wat Pho & Wat Phra Kaew are almost opposite on the other side of the river making all three convenient to visit on the same day. The temples name derives from the Hindu god Aruna often personified as the radiations of the rising sun. 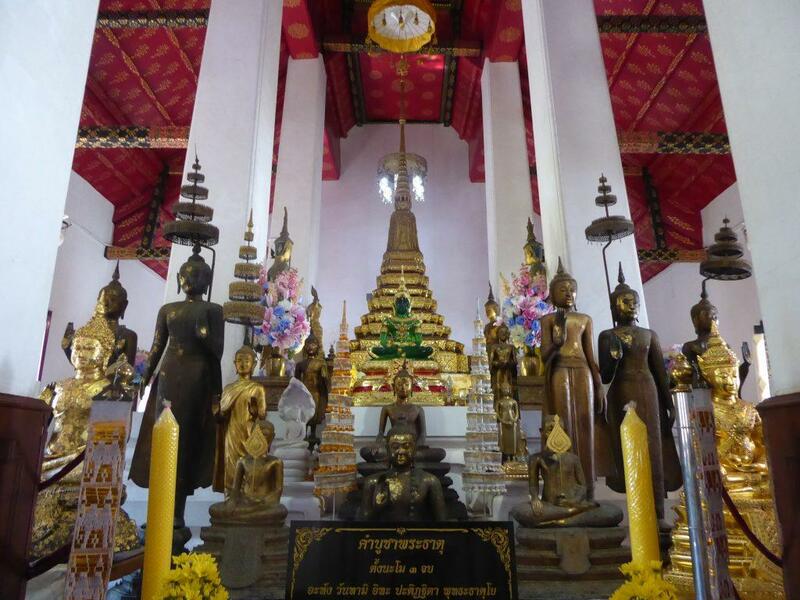 The ancient temple dates back to the 17th century although its distinctive spires (prangs) were built in the early 19th century during the reign of King Rama II. 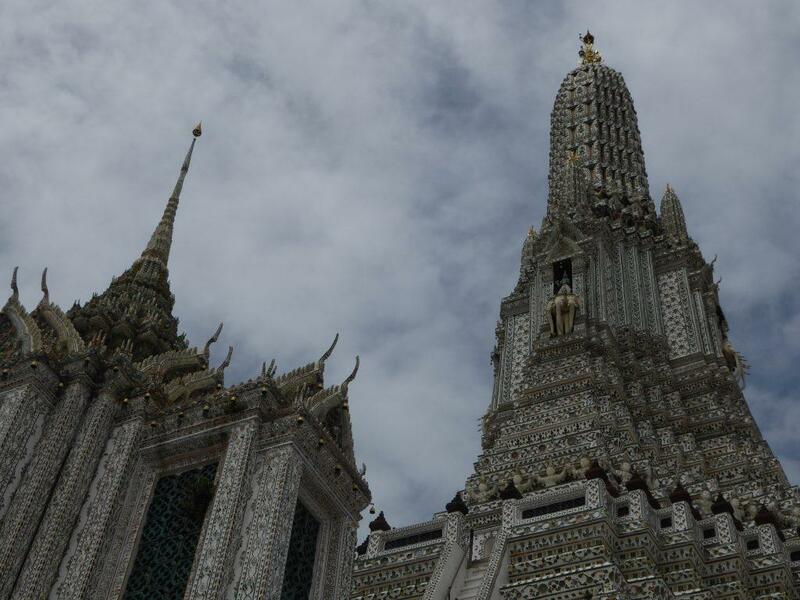 The central spire is unlike other Bangkok temples and looks spectacular when lit up at night. The riverside setting is a great place to watch the sunset. The temples unique design consists of four smaller prangs and four mondop around a large Khmer style prang (tower). 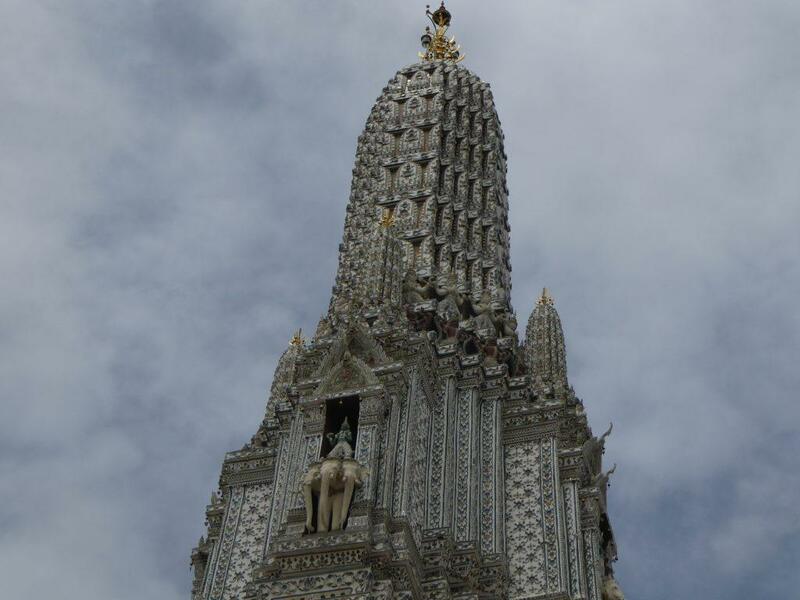 The 79-meter central prang is the height of a 20-story building making it the tallest prang in Bangkok. The central Prang represents Mount Meru, the home of the gods, topped with a seven-pronged trident. You can climb to the platform of the central prang though the steps are very narrow and steep. Since the restoration of the temple you can no longer climb to the top. 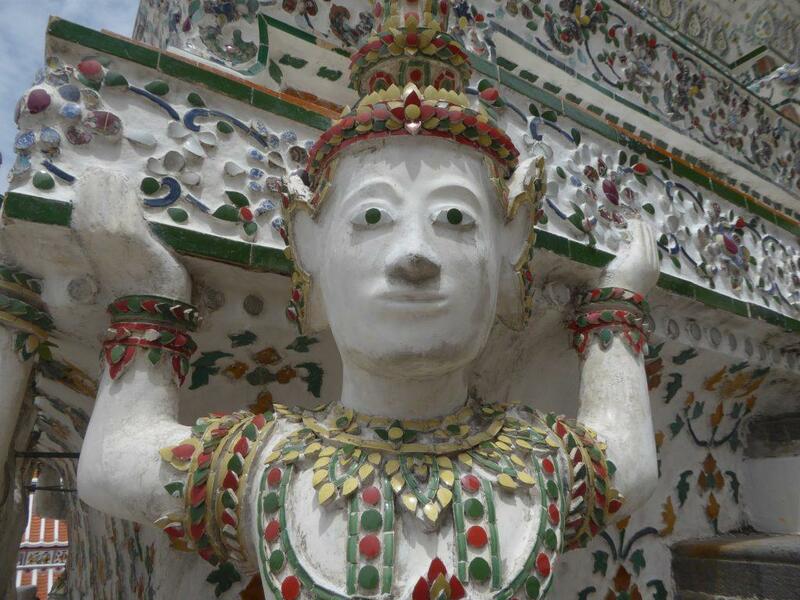 Statues of mythical Yaksha demons and half-bird, half-human kinnari support the different levels of the prang. 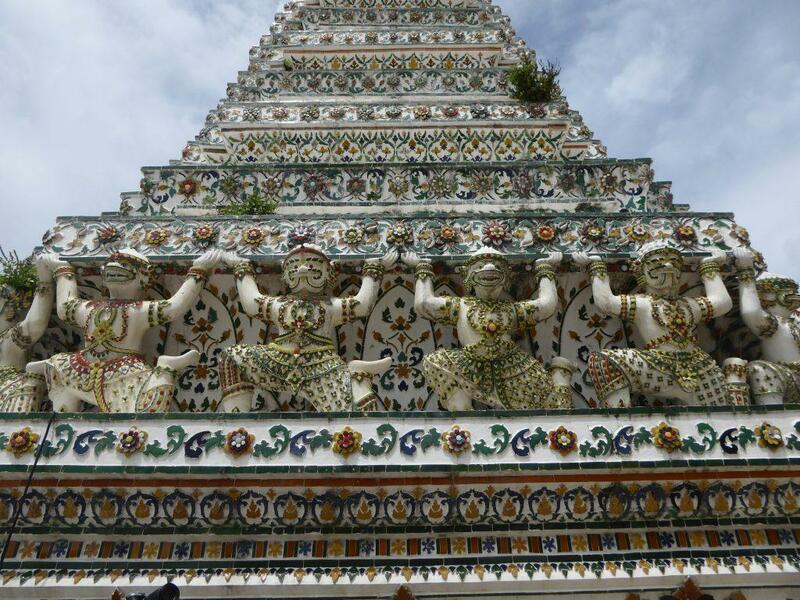 On the first level, is the central prang, surrounded by four mondops and four smaller prangs. 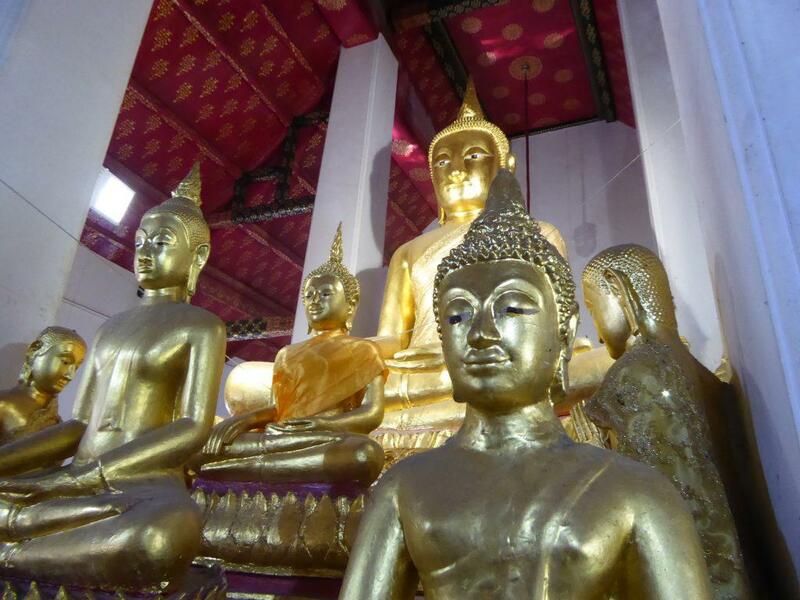 The four mondops each contain a Buddha image representing four important events in the life of the Buddha, birth, preaching his first sermon, enlightenment and entering nirvana. These are not open to the public. 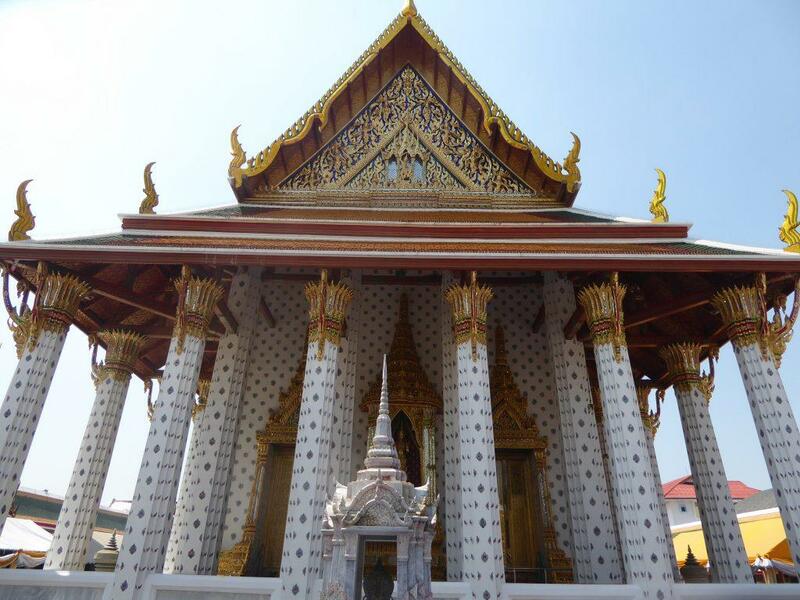 The second level which surrounds the base of the prang has closed entrances, guarded by four statues of the Hindu god Indra on his three-headed elephant Erawan. 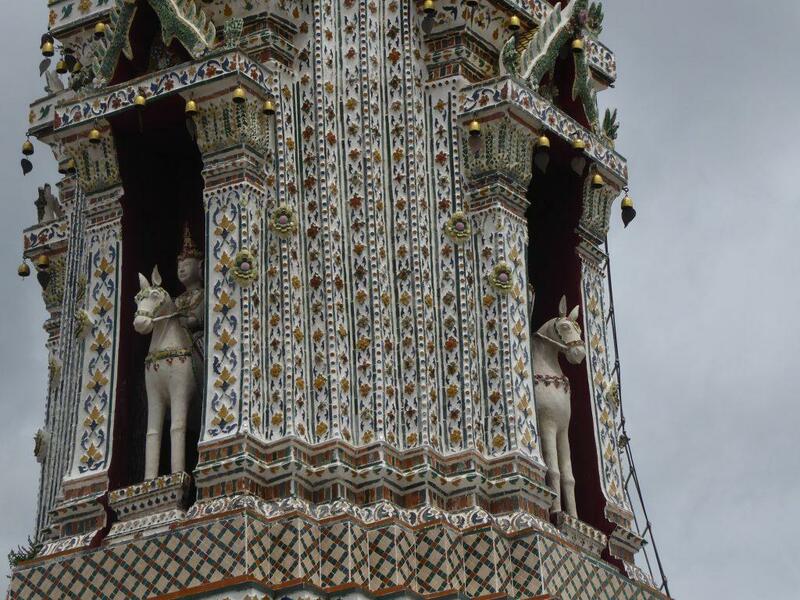 In the niches of the smaller prangs, there are statues of Phra Pai, the god of the wind, on horseback. 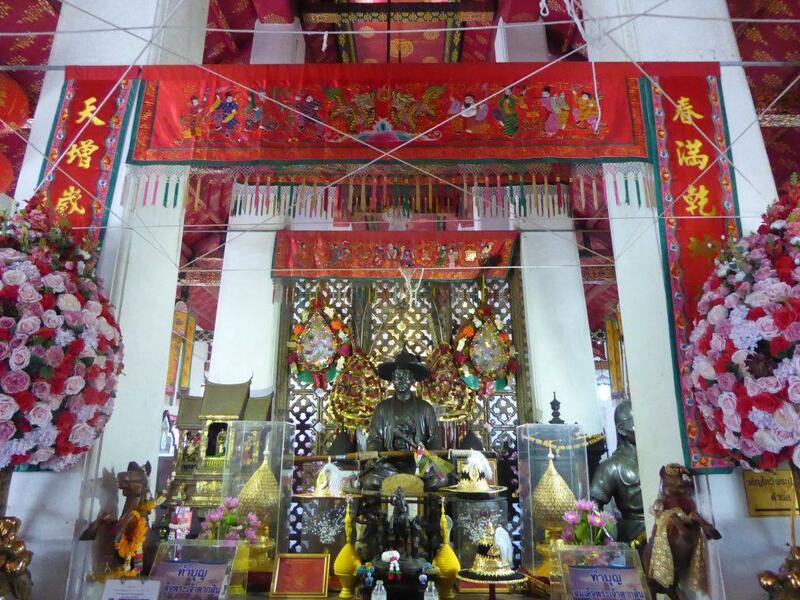 One of the Mondops houses a shrine that contains a copy of the Buddha’s footprint. The prangs, decorated in a mosaic style with brightly colored pieces of Chinese porcelain and seashells. People pay homage to Phra Prang with 3 incense sticks, a pair of candles and walk in clockwise circles of Phra Prang 3 times. Hindu god Indra on his three-headed elephant Erawan. 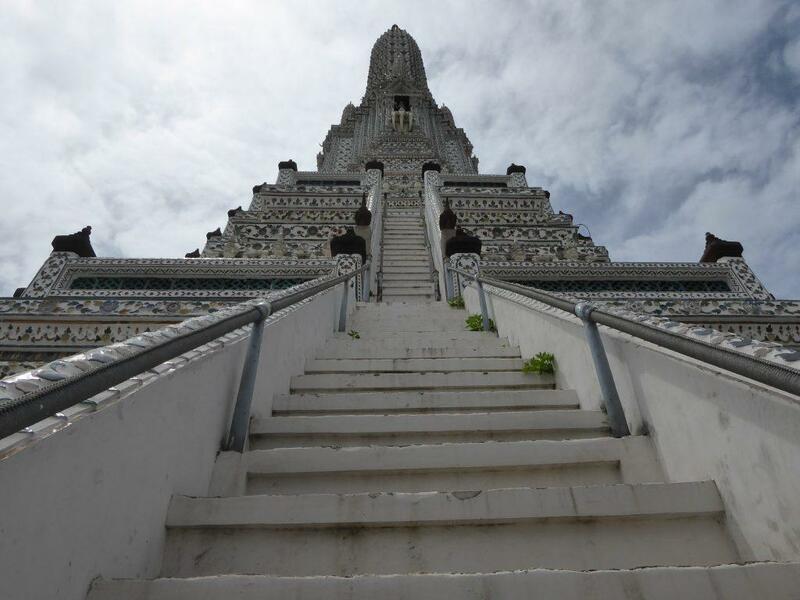 The admission ticket for Wat Arun is for the enclosed area containing the prangs & mondops. 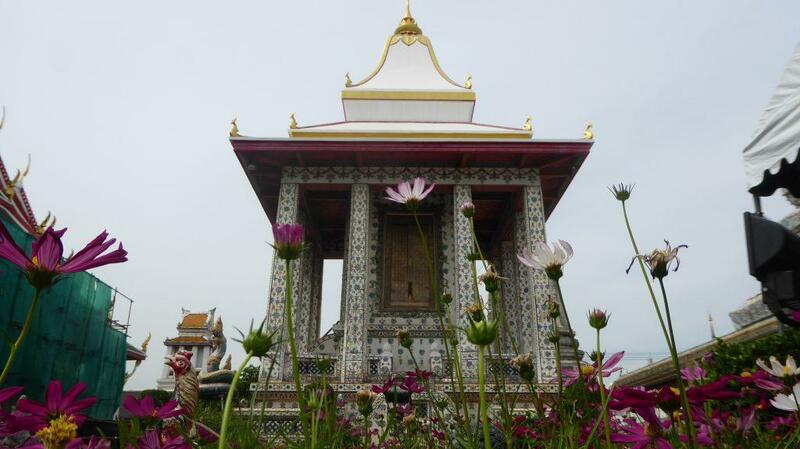 The temple and grounds surround the central area and are free to enter. 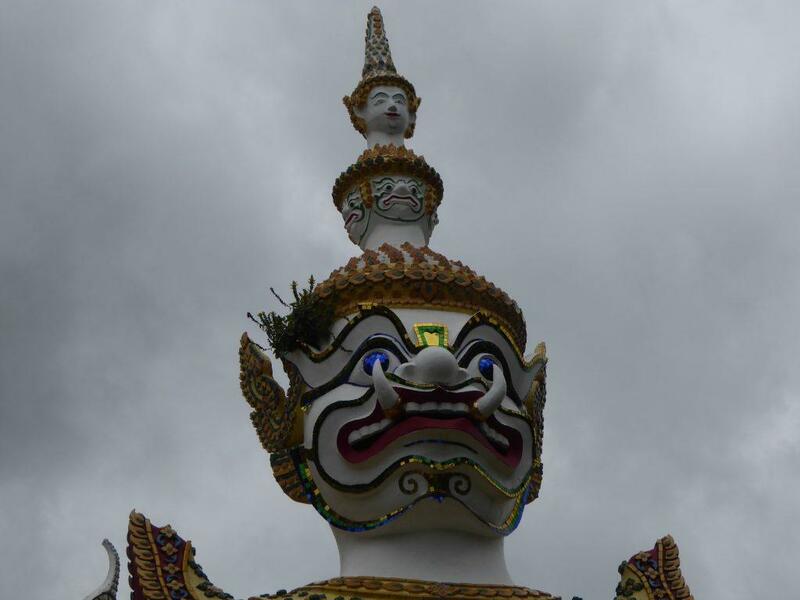 The temple area is through the gate guarded by two large Yaksha guardian statues. Passing through the gate you will come to a large courtyard containing the Ordination Hall. Lining the walls of the courtyard known as the Rabiang Kot Gallery are many Buddha Images. 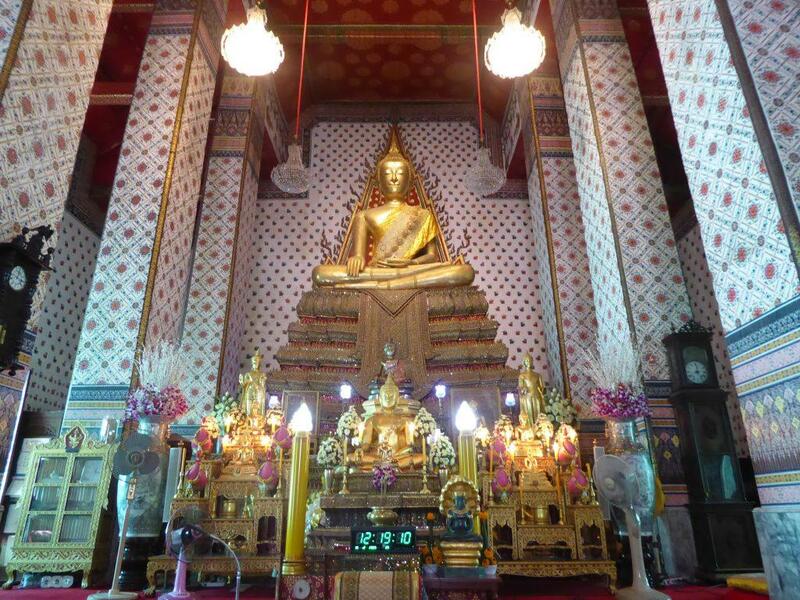 Inside the Ordination Hall is a Niramitr Buddha image named Phra Buddha Dhammisornraj Lokathatdilok designed by King Rama II, and the base contains some of his ashes. 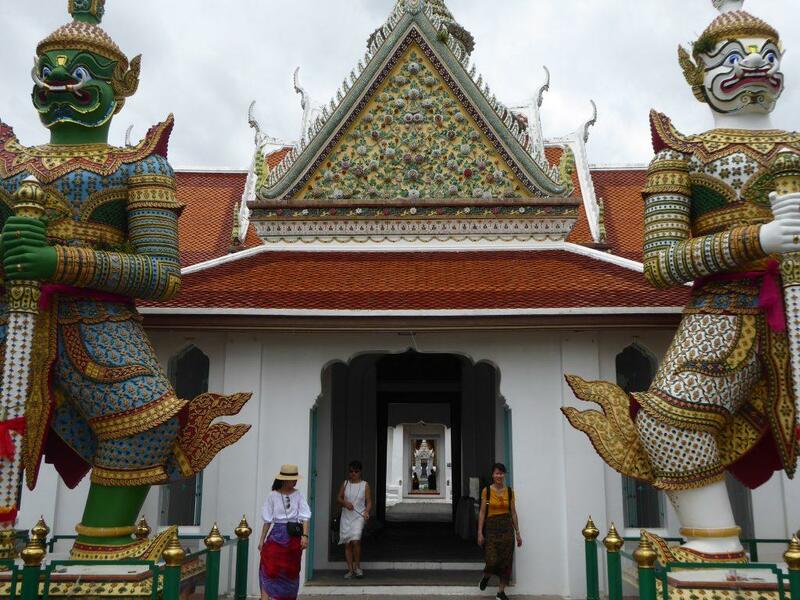 The walls, decorated with colorful murals that date from the reign of King Rama V. Two Yaksha guardians guard the front entrance of the hall which has a roof with a central spire, decorated in colored ceramic and stucco work sheeted in colored china. Outside the courtyard and behind Wat Arun”s Prangs is the newly renovated Vihara containing the Buddha image Phra Phuttharup Narumit. Next door is the temples main Mondop. 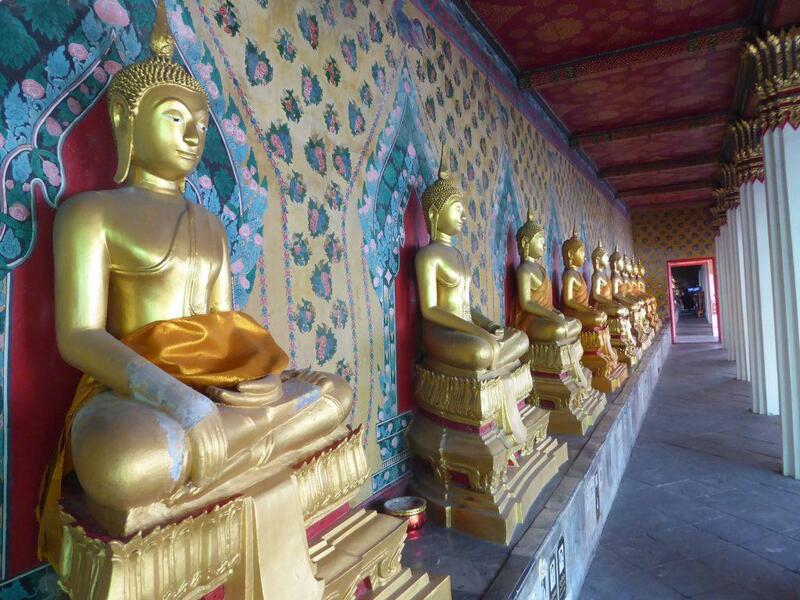 More Buddha Images can be found in buildings to both sides of the main entrance to the Prang by the river. These were formerly an Ubosot and Vihara before the building of the larger ones. There is also a statue of King Taksin the great. 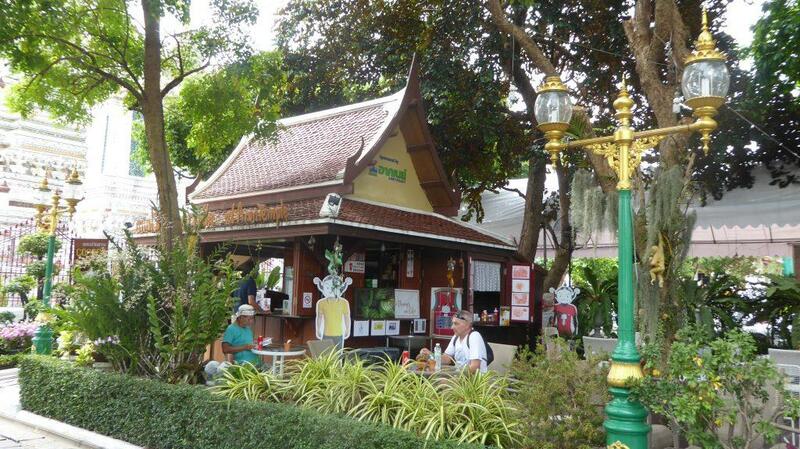 There are more statues around the grounds as well as a rock garden, a pleasant outdoor cafe and a market selling souvenirs and traditional Thai clothing. 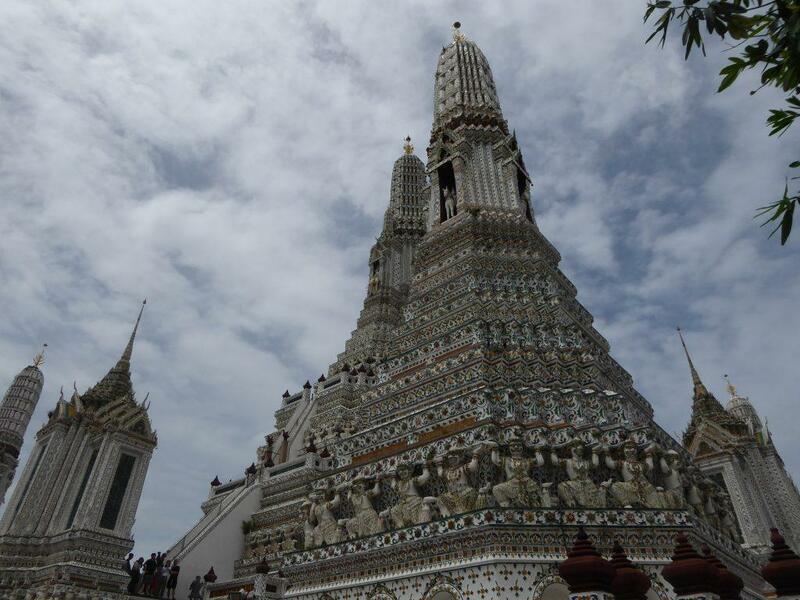 The best time to visit Wat Arun is early in the morning or late afternoon when it’s less crowded. 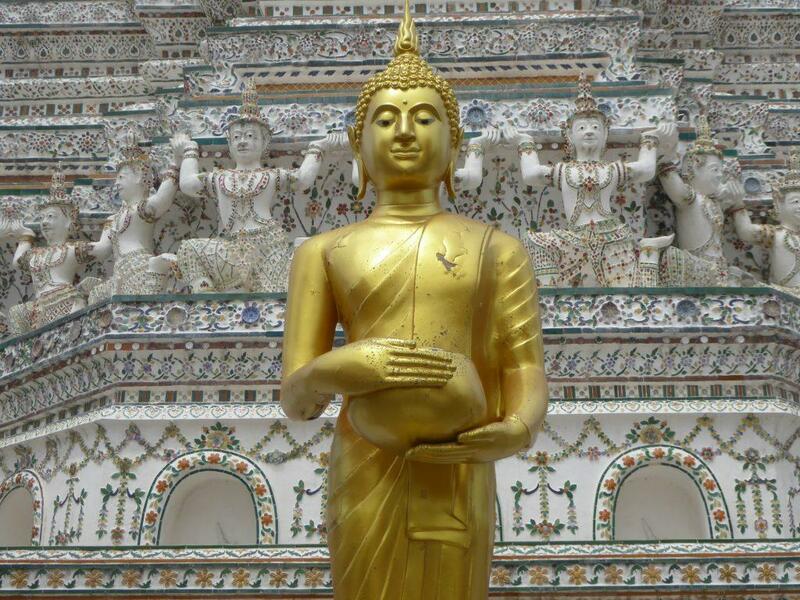 It’s good to combine with a visit to Wat Pho as it’s just across the river. 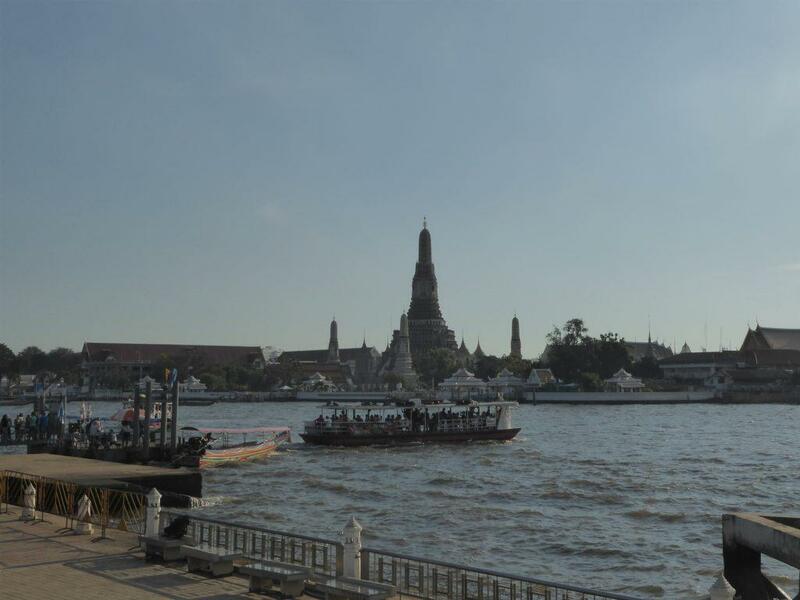 The cross-river ferry leaves from Tha Tian Pier opposite Wat Pho and costs 4 baht. 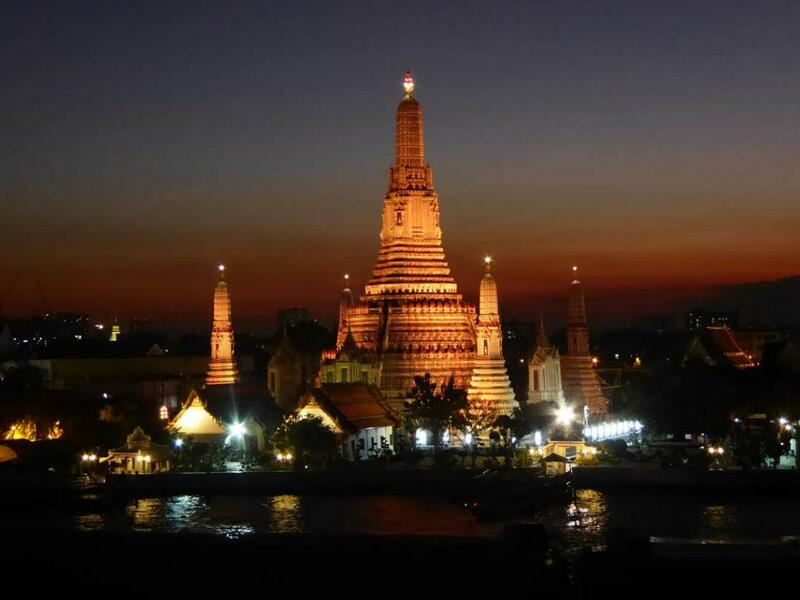 The sun sets behind Wat Arun providing some stunning sunset views. There is a small park almost opposite the temple on the other side of the river but the best places to take in the sunset are the rooftop bars at Sala Rattanakosin or the Eagles Nest next door. Photo: Diego Delso, CC BY-SA 3.0. 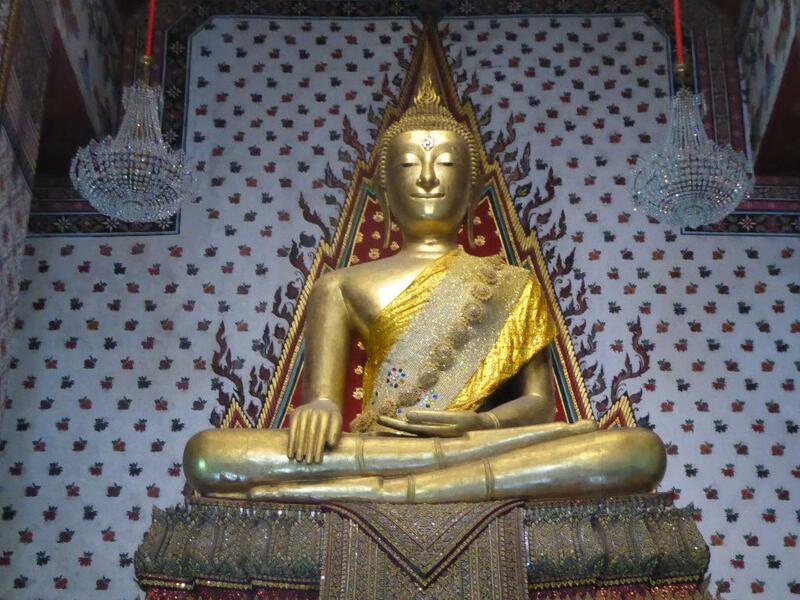 Other Photos by Tourist Bangkok. Rules: No Shorts, Short Skirts, Sleeveless shirts.